State Broadcaster Association Executives were granted hands on time with the new NextRadio app developed by Emmis Communications during a session of the NAB/RAB Radio Show. Making the presentation was Emmis CEO Jeff Smulyan and Senior Vice President/Chief Technology Officer Paul Brenner. 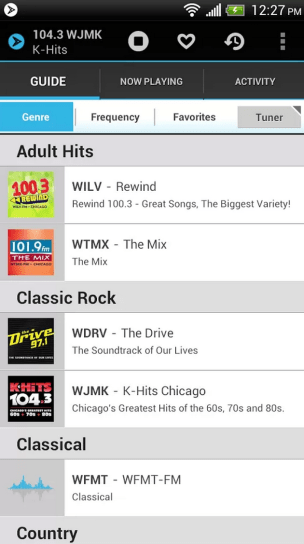 The application makes use of an FM chip in HTC One and HTC EVO 4G LTE phones carried by Sprint as part of the deal struck between Emmis, on behalf of the radio industry and the nation’s third largest cellular company. The application allows users to tap into the FM chip and listen to over-the-air FM radio anywhere. The application will seem very familiar to anyone who has used Clear Channel’s iHeart Radio or the CBS Radio.com app. You can scroll through available stations and see station logos by default (and without a charge to stations). Stations that use the optional, web-based, TagStation service can show artist and song information and can even have listeners participate in station promotions, interact with advertisers and even send feedback on a song back to the station. The difference, of course, being that the music itself is received just like your car radio, over-the-air. The advantages to utilizing an over-the-air signal are significant. One, using the FM chip as opposed to 4G service saves users a substantial amount of data. As Brenner pointed out at the Radio Show, cell data is going to become more and more expensive as time goes on and to be able to give consumers music, news, talk, sports and weather anywhere they go without incurring data costs is a huge plus. Second, utilizing NextRadio and the FM chip doesn’t use as much battery. It seems the more advanced the phone, the less battery life it has. Lastly, and most importantly, NextRadio will still be available should the internet become unavailable in an emergency. The same emergency information that consumers rely on from traditional over-the-air television and radio can be had in the palm of their hands with an FM chip and the NextRadio app. 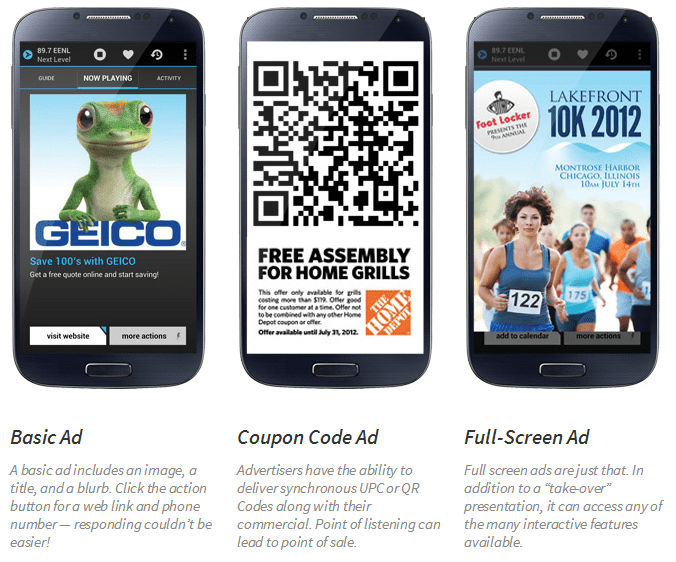 The benefits of the app aren’t just for the consumer. The ability to add a station promotion or enhancing a client’s over-the-air ad could mean the difference between making the sale and being left in the 20th century. Watch the promo video and the demonstration video. 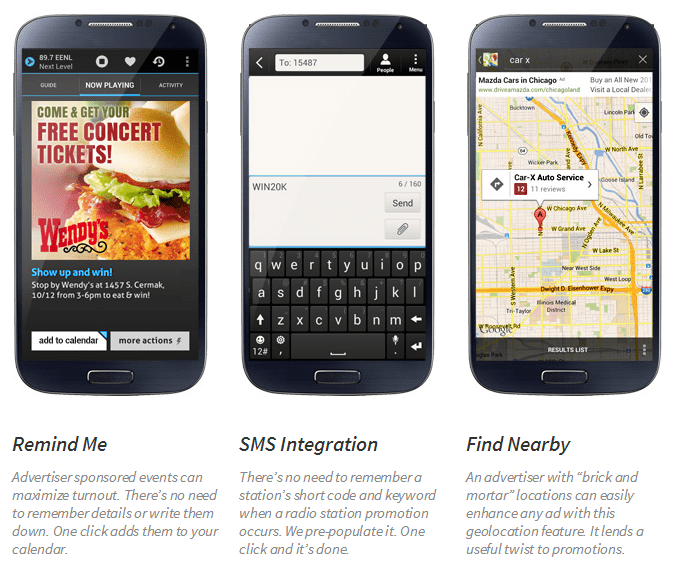 Here are a few ways you can utilize TagStation within the NextRadio app. This demonstration made a very strong argument for FM broadcasters of all shapes and sizes to get involved. At the very least, stations can show their branded logo or tagline for free. The additional benefits of the Tagstation platform come at an extra charge. For more information you can log on to TagStation.com/nextradio.